Bubby and Bean ::: Living Creatively: Fall Fashion GIVEAWAY // Win a $100 Shopping Spree at Marshalls! 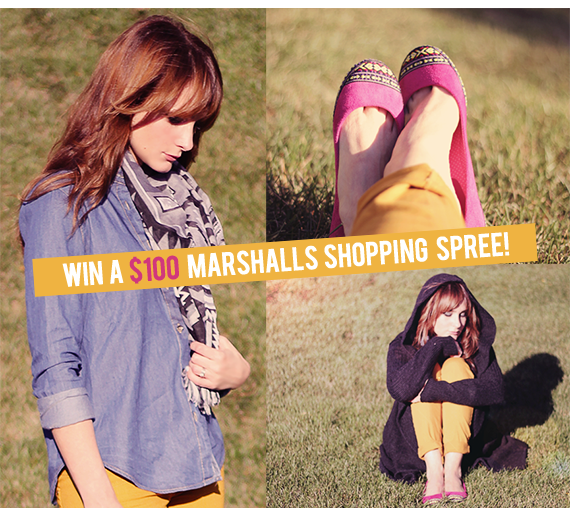 Fall Fashion GIVEAWAY // Win a $100 Shopping Spree at Marshalls! Last week, I posted about how I participated in a fall fashion challenge with Marshalls. They sent me off to my nearest Marshalls store with $100, where I was to shop for a head-to-toe look incorporating a top fall 2012 fashion trend. From the options given, I chose color (mustard yellows, deep pinks, and dark greys) for my trend. And in the end, the challenge was a success! I was able to find a sweater, top, scarf, pants, and shoes that I absolutely loved. (You can see the full post and pictures right here). And now... it's your turn! One lucky Bubby and Bean reader is going to win a $100 gift card to go on a Marshalls fall fashion shopping spree of their own! This giveaway is open to all Bubby and Bean followers/subscribers. To enter, leave a comment telling me either the fall trend you're most excited about OR the best designer score you've ever found at Marshalls. That's it! This giveaway is open through September 23rd. The winner's name will be chosen randomly and announced soon after. GOOD LUCK! I scored the most adorable boots, almost 4 years ago at Marshalls, I still have them and love them as much as I do when I first got them! Fall trend i'm most excited about: colored trench! my fall trend that i most exited about is a colorful flowers. I love Marshalls! They have the best stuff! I am excited about long skirts, scarves, sweaters and everything necessary for layering! It's going to be a fantastic fall! I follow via GFC. I am most excited about boots! The best score I ever picked up at Marshall's was a rhinestone covered Christian Audigier clutch - for $5. I still LOVE it! I cannot wait for mustard cardigans and fall boots to be in season! I LOVE the outfit you put together...you are so pretty a d those colors look great on you! :) The trend I'm loving would have to be pattern mixing and chevrons. I hope I win! i can't wait for layered, chunky knits! this is the funnest giveaway! i have been a marshall's shopper forever!!! i love that i can find free people threads there for way cheap! my favorite fall trend besides just the yummy colors, like mustard, deep teal, browns... would have to be the abundance of layers. oh how i love layering. love this!! i like your pretty face on facebook! you know i follow your awesome pin board! Favorite fall trend! Easy, oversize vintage sweaters with fancy tights! I just love the fall colors!! Can't wait to bring out my browns, pumpkins & spice shades with boots & leather & dreamy loveliness! I'm lovin' the denim, oversize sweater look for fall! I am ready to get all my fun scarves out for fall! The fall trend I'm most excited about trying out is the colors! Titanium, Oxblood and Mustard Yellow! I love Brown leather boots, military green with hints of red, and tribal prints. I love Marshall's! My best score ever was a darling pair of Kate Spade shoes. I wear them all the time! My BEST Marshalls find ever (in NYC, no less!) -- A pair of Kelsi Dagger black leather, silver-studded, peep-toe, open heel lace up high-heeled ankle boots. YES! Extra Entry: Like (love) Bubby & Bean on Facebook! I managed to find a super adorable pair of boots for around 40$, looked them up online and found them for 100! Ya gotta love Marshalls! Oh also, I think my favorite fall trend that I'm excited for is probably being able to wear my mustard yellow tights every day! I love fall, wearing cute scarves, sweaters, boots, whats not to love! Marshalls is my go to for all the latest trends. Won't damage the wallet and they have great brands! You will see Marshalls on several of my outfit posts over at AllisonMaeB.blogspot.com! i love long sleeves, scarfs and boots! I am most excited for maroon and hunter green everything this year! I'm really excited about all the bohemian earthy things I've been seeing- feathers, chevron patterns, tribal prints. I looove it. I can't get enough boots.....ever!! I follow on Pinterest and like you on Facebook! I'm pretty excited about boots (always) and colored skinny pants! And Instagram! Thanks for the opportunity! i'm loving oversized sweaters for this fall! Best Marshalls find: a mod Anne Taylor white dress for my San Francisco City Hall elopement last November! I feel like everywhere I look- there are leopard print flats! I need a pair in my closet- ASAP. I liked you on Facebook as Jennalee Cook! Thanks for the opportunity B&B! I also just started following you on Pinterest as Jennalee Cook, looking forward to checking out your boards! I'm most excited about navy or tan/cream/neutrals with pops of color- love the mustard yellow. I always score some great finds at Marshalls- last year I picked up an amazing pair of boots that I can't wait to break out of the closet again! I am most excited about printed denim!! SO AMAZING! I like B & B on FB..
DEFINITELY the boots. I feel like this is the year I get I pair! I am SO excited for fall.... studded everything, especially boots!! I'm most looking forward to layering my denim jacket over ugly sweaters! Best Marshall's designer score ever, black leather/suede Tahari "bomber" jacket! My favorite Lucky Jeans came from Marshalls. I'm now following you on Bloglovin as well. I'm excited about fall boots! Best designed look I ever scored at Marshalls: The full length gray satin with beaded top dress that I wore to Obama's Inauguration ball in 2009!!!!! (Original price, almost $200, I paid only $20.00). WOW! Great giveaway :) I'm a follower of your blog! My favorite fall trend is CORDS! I need a pair... bad! that's my twitter username too... sorry I forgot to leave it before! I also follow via bloglovin in - what can I say, I'm a fan!!!! I'm excited about the sweater and scarves! I follow! I'm most excited for boots, and my kelly green skinnies! My favourite fall trend is cute ankle booties!! !